- The Express hit the field at 3:15 pm CT on Saturday with head coach Mike Singletary and his staff addressing the team on its first practice of training camp. 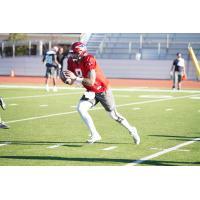 - The Express held practice at Cornerstone Christian School on the north side of San Antonio. - Standing out among first-round draft pick QB Troy Cook's (UT-Martin) many throws were connections with WR Ryan Timmons (Kentucky) and TE Luke Papilion (Sioux Falls). Timmons nabbed a deep crosser late in the day. Papilion secured a diving grab running up the seam. - On the defensive side of the field, a spectacular play in coverage by LB Dale Warren (Chattanooga) drew an excited reaction from coach Mike Singletary. Praising his linebacker, Singletary shouted "Somebody's been listening!" - Though it's difficult to evaluate the running game before pads come on, RB Kenny Hilliard (LSU) showed terrific burst on a number of handoffs and expects to contend for the starting role. - Head Coach Mike Singletary on the first day: "I was impressed with the way they worked. There was a lot of energy out here today. We just have to keep working, but it was a great first day. I want to see us compete and really become a special defense. We're working toward the habits that we need to develop with communication. I thought today was a good first step." 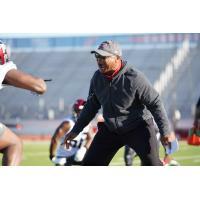 - Head Coach Mike Singletary expanding on the habits he wants to see develop: "Being able to see Cover 1, Cover 2, Cover 3, and being able to see it back there without even knowing what the call is, but they can't all look the same. There's a technique for each one of those defenses, and today we want to use those. We play faster as we go, and guys just have to learn the defenses." - Head Coach Mike Singletary on the quarterback competition: "They're all competing. It's nice to see the competition. Of course, they've got some nice receivers to throw to and they're developing a rapport early on. I saw some good connections up the field. It's going to be a great, great battle." - WR Kayaune Ross (Kentucky) on the team's mindset entering training camp: ""It's good friendly competition, we all want to make each other better. Right now, we're all in competition but we want to make the room better and learn. We use each other to learn, and everybody's getting along very well." - WR Kayaune Ross (Kentucky) on what Mike Singletary's influence brings: "Energy. He's holding everybody accountable. Everybody has to go and do their job. That's what it's like with him." - LB DeMarquis Gates (Ole Miss) on playing for Mike Singletary: "It's tough but it's easy, because he's giving us all his tricks, but it's hard because he's already been there and done that before. Basically, we have to step up to his level. We're trying to play for a hall of famer. We're trying to step up our game and show him we're able to play for him." - LB DeMarquis Gates (Ole Miss) on The Alliance's regional allocation system: ""It's a great experience. I love playing with great players. We've got some folks from LSU, all types of places, UT-Martin. It's a great environment, bringing together all these different experiences to work towards one goal."